And pictures like the one above, tweeted from kind folks like Josh Jackson at Paste Magazine, showing happy crowds in straw hats eating picnic lunches on the sunny shores of Newport (sigh) are the proverbial knife-twists in the stomach. If that’s even a proverb. 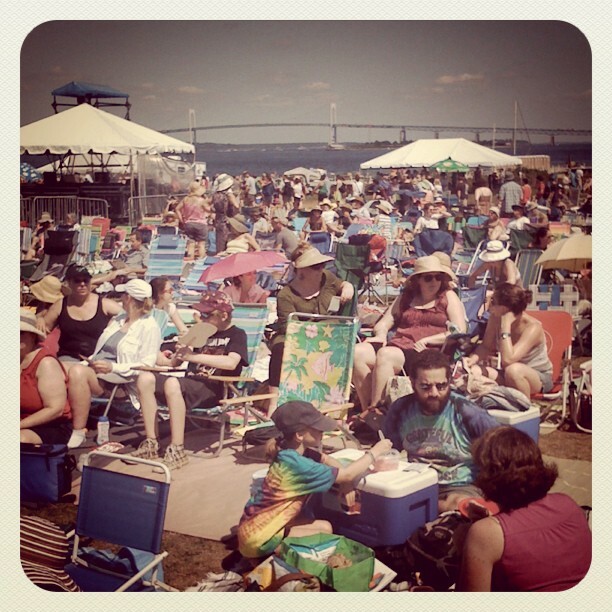 This photo, snapped just moments ago and tweeted by @Newportfolkfest staff, also tugged at my heartstrings … the PS22 chorus singing “Imagine.” They’ll also be workin’ their tiny vocal chords with the likes of Freelance Whales and others at the Lego tent in just moments from now. But alas, positivity should abound, right? The good people at NPR are streaming the festival live both Saturday and Sunday, so I suggest taking a look-see and watching your favorite acts from the air-conditioned comfort of your own homes. At the inaugural 1959 festival, Joan Baez and Bob Gibson played to enthralled crowds. Baez was basically an unknown during the first performance … an 18-year-old singer not even mentioned on the program. Turn out alright, she did. And a little piece of inside information … did you know that during the first years of the festival, all the acts (other than the main headliners) played for a mere $50 paycheck? Talk about true folk culture. Of course there’s also the infamous “electric Dylan” performance from ’65 that sparked a war among American folk purists. Although, a “war” among folkies sounds as jarring as a “fistfight” among pacifists. But, I digress. If wanting to be a part of this history doesn’t make you get in line to buy your tickets for 2012 early, I don’t know what will.